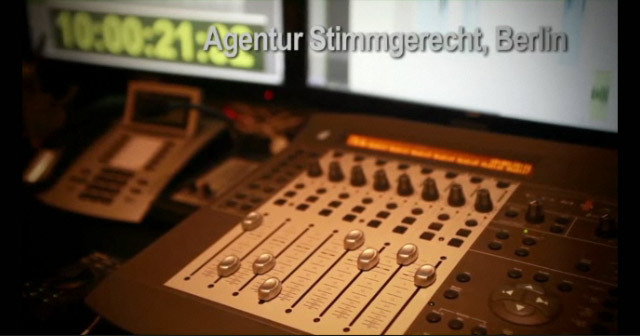 For nearly 20 years Agentur Stimmgerecht oHG has been successfully placing native voice over talents, artists, actors, comedians and other performers for advertising, film-dubbing, voice-overs, documentaries etc. We also advise you in finding the appropriate voices for industrial films, audio books, audio dramas and computer games. Agentur Stimmgerecht oHG is the German market leader among voice agencies. Our service includes individual consultation to enable you to find the right voice over artist for your project, be it a commercial, an industry-video, dubbing, voice imitation or translation. With more than 2.500 qualified voice over artists Stimmgerecht offers a huge variety of talents from around the country, and our pool of native foreign-language speakers is constantly growing. Our two studios with state of the art technology offers optimal conditions for the professional realization of your projects. Below are randomly generated lists of voice over artists. A detailed search is facilitated on the right. The listed actors, native speakers, popular voices, voice over talents, advertising and promotional voices guarantee first-class quality due to many years of experience. We produce audio recordingsof all kinds in our two modern studios in Berlin. The recordings are realized by qualified sound engineers in a friendly, familiar atmosphere. We work together with numerous partner studios and production companies In other cities and countries - this ensures rapid and convenient recording times. Our team in Berlin advises you with the voice selection in any language and assumes the complete organization of your production - including translation services. Chose Agentur Stimmgerecht oHG, whether your project calls for foreign language native speakers, commercial voice over talents or traditional dubbing, we always strike the right tone!